Good pre-workout supplements cut down on unnecessary carbs and sugars and include only ingredients that increase endurance and strength and reduce fatigue during workouts. Helping an athlete boost energy levels, endurance, and muscle power during a workout has obvious benefits; the longer and more vigorously you work out, the more lean muscle you will build and the more fat you will lose. The Jax Pre Workout formula does all of the above and features a vasodilation matrix, which will ensure that you experience improved muscle pumps, nutrient and oxygen delivery, hormone transport, and body temperature regulation. Additionally, nitric oxide boosting Arginine-AKG is the most important supplemental ingredient for maximizing lean muscle gains, strength, size, vascularity, and increased nutrient uptake. Combined with the Jax line of intra- and post-workout supplements, you will be poised to maximize performance, build major lean muscle, and recover rapidly. Serious weightlifters and other members of the fitness community keep a careful eye on potential muscle loss even as they look toward helping their muscles recover after a hard workout. More and more, exercise buffs are turning to branched-chain amino acids to prevent muscle breakdown. Jax BCAA NRG features a 2:1:1 ratio, plus 10 grams of BCAA to meet your protein synthesis needs. This formula will maximize muscle recovery and prevent muscle breakdown from dieting or exercise. Added laxogenin for an additional muscle building boost! Among our featured products is a fantastic carbohydrate supplement that will promote muscle growth when you've finished your workout. Replenish glycogen reserves and boost supplemental uptake with a thoughtfully designed carbohydrate supplement that includes everything you're looking for! 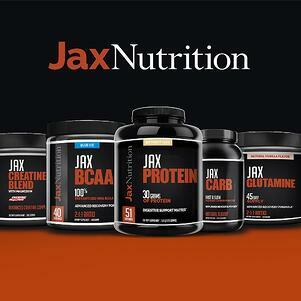 Jax Carbs provides you with slow and fast release carbohydrates to allow for even nutrient uptake throughout. Creatine magnapower and branched-chain amino acids promote muscle health. This easy-to-mix, naturally flavored formula includes electrolytes and ALA for the best nutrient absorption. When you're working hard to achieve the shape you want, it's important to maintain a steady metabolization of protein and minimize the breakdown of muscle tissue. Added muscle recovery is also a must. Choosing a glutamine supplement can help you buoy both your health and your hard-won gains. Our featured products include Jax Glutamine, a glutamine supplement with a natural vanilla flavor that mixes easily with water. It gives you eight grams of Glutaflex and added electrolytes with each serving. Strengthen your immune system, maintain cell hydration, and prevent muscle catabolism with this delicious, convenient supplement. Looking for more energy while you push yourself to new fitness heights? Creatine supplements can give you the boost you need while improving your strength and increasing your lean muscle. Jax Creatine Blend offers you Creatine MagnaPower for a workout lift with benefits that last beyond the last rep or final mile. Protein supplements are the best-known offerings in the fitness world. Yet these featured products often leave the taste buds cold with bland, boring flavors that make them tolerated at best. Jax Nutrition aims to change that view with a protein supplement that's full of flavor. Drink to your health with flavors like snickerdoodle, birthday cake, s'mores, and oatmeal cookie! Each delicious serving includes 30 grams of protein, as well as a digestive enzyme matrix for a no-bloat protein. Conjugated linoleic acid, combined with good diet and exercise, can help release stored fat from hard-to-reach areas such as the midsection, even as it prevents the absorption of saturated fats. It's an excellent tool to add to the fitness lover's toolbox. Jax CLA provides an essential lipid, and is a great source of heart-healthy fat. The added L-Carnitine can improve weight loss, and the added Omega-3 acids are a vital nutrient. This formula can assist with controlling appetite to support your dietary goals.